"Many scientists today are working to retard the aging process in humans so as to increase both life expectancy and the quality of life. Over the past decade impressive results have been achieved in targeting the mechanisms and pathways of aging. 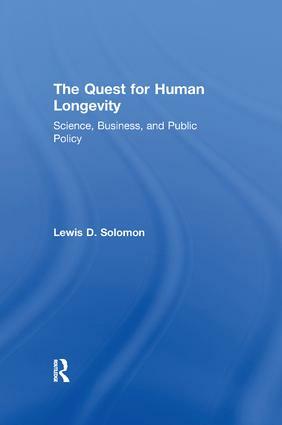 In The Quest for Human Longevity, Lewis D. Solomon considers these scientific studies by exploring the principal biomedical anti-aging techniques. The book also considers cutting edge research on mental enhancements and assesses the scientific doubts of skeptics. The Quest for Human Longevity is also about business. Solomon examines eight corporations pursuing various age-related interventions, profiling their scientific founders and top executives, and examining personnel, intellectual property, and financing for each firm. Academic scientists form the link between research and commerce. Solomon notes that the involvement of university scientists and researchers follows one of two models. The first is a traditional model in which scientists leave academia to work for a corporation or remain in academia and obtain business support for their research. The second is a modern model in which scientists use their intellectual property as a catalyst for acquiring equity interests in the firms they organize. Critics have pointed to the dangers of commercialized science, but Solomon's analysis, on balance, finds that the benefits outweigh the costs and that problems of secrecy and conflicts of interest can be addressed. If scientists succeed in unlocking the secrets of aging and developing drugs or therapies that will allow us to live decades longer, the consequences for society will include profound social, political, economic, and ethical questions. Solomon deals with the public policy aspects of significant life extension and looks at the conflict between those who advocate the acceptance of mortality and the partisans of life. The Quest for Human Longevity will be of interest to policymakers, sociologists, scientists, and studen"
The Ups and Downs of Telomeres and Telomerase: Geron Corp.
Oxidative Damage from Free Radicals and the Anti-Oxidant Antidote: Juvenon, Inc. and Eukarion, Inc.
Caloric Restriction and Its Mimics: BioMarker Pharmaceuticals, Inc.
Genetic Manipulation, Its Mimics, and Biochemical Activators: Elixir Pharmaceuticals, Inc. The Search for Memory-Enhancing Drugs: Helicon Therapeutics, Inc., Memory Pharmaceuticals Corp., and Cortex Pharmaceuticals, Inc.